The economic effects of the unprecedented levels of international migrations over the past few years are at the centre of political debates about immigration policy. This column evaluates the causal effect of migration on foreign direct investment using immigration patterns to the US going back to the 19th century. Foreign direct investment is found to follow the paths of historical migrants as much as it follows differences in productivity, tax rates, and education. The results suggest a mechanism of information flow facilitation, and that the effect of ancestry on foreign direct investment is very long-lasting. Over the past decades, international migrations have reached unprecedented levels, shaping an increasingly ethnically diverse and socially connected world.1 The economic consequences of these migrations are at the heart of fierce political debates on immigration policy, yet our understanding of the economic effects of migrations remains incomplete. At the same time, local policymakers see attracting and retaining foreign direct investment (FDI) as a major goal, and technology transfers through FDI are both a conduit for technological progress abroad and a source of revenue for US firms (Holmes et al. 2015, McGrattan and Prescott 2010). In this column, we show that immigration and FDI are intimately related – the ethnic diversity created by migrations reaching back more than a century has a large positive causal effect on the ability of US firms to engage in FDI with the historical migrants' countries of origin. Evaluating the causal impact of migrations on FDI is tricky – many unobserved factors may simultaneously affect migrations, ancestry, and FDI, creating a spurious correlation between them.2 For example, migrants from Sweden may have historically settled in Minneapolis because it is climatically similar to their origin country, and these climatic similarities may also drive trade, business opportunities, and investments in Sweden today. Does Minneapolis receive Swedish investments today because of the weather or because of the presence of descendants of Swedish origin? In a recent paper, we distinguish causation from correlation using an approach that is best explained by the examples of migrations from Germany and Italy (Burchardi et al. 2016). In particular, German migrations to the US peaked at the end of the 19th century when the Midwest was booming and attracting large numbers of migrants. We observe a relatively large population with German ancestry in the Midwest today. Italian migrations peaked a few decades later, at the beginning of the 20th century when the West was attracting large numbers of migrants. We observe a relatively large population with Italian ancestry in the West today. We use this interaction of time-series variation in the relative attractiveness of different destinations within the US with the staggered arrival of migrants from different origins to instrument for the present-day distribution of ancestries. One may think of migrations from a given origin country to a given US destination county in decade t as depending on the total number of migrants arriving in the US from that origin (a push factor) and the relative popularity of the destination among migrants arriving at the time (a pull factor). The number of residents in a given US destination today who are descendants of migrants from a given origin should then depend on interactions of the sequence of pull and push factors going all the way back to the 19th century. To construct valid instruments from this sequence of interactions, we isolate variation in the pull and push factors that is independent of any unobservables that may make a given destination within the US differentially more attractive for both settlement and FDI from a given origin country. To that end, we leave out the migrants’ continent of origin when calculating the share of migrants choosing a given destination (the pull factor), and leave out the states surrounding a destination when calculating the push factor for a given destination. For example, we predict the number of Swedes that settle in Minneapolis in 1920 with the interaction of the share of non-European migrants arriving at the time that settle in Minneapolis and the number of Swedes arriving in the US at the same time that do not settle in the Midwest. Using this approach, we document that FDI follows the paths of historical migrants as much as it follows differences in productivity, tax rates, education, and other conventional determinants of economic competitiveness – for the average US county, doubling the number of individuals with ancestry from a given origin country increases by 4 percentage points the probability that at least one firm from this US county engages in FDI with that origin country, and increases by 29% the number of local jobs at subsidiaries of firms headquartered in that origin country. As an example, Figure 1 shows the relationship between the number of foreign subsidiaries based in Cook County, Illinois, and the predicted number of residents with ancestry from that foreign country. 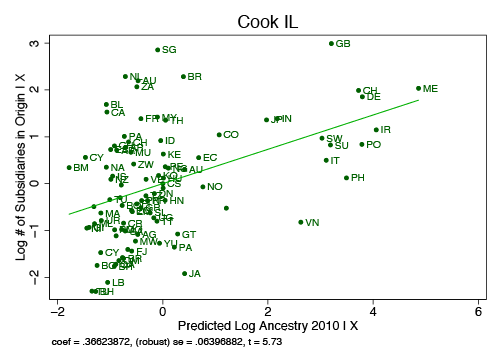 Notes: This figure shows a conditional scatterplot from a regression of log # of subsidiaries in Cook County, IL on predicted log ancestry in 2010. The regression coefficient and standard error are given under the plot. Because the descendants of migrants and the present-day population of origin countries may have shared tastes for consumption goods. We find an array of evidence most consistent with the first channel.3 The effect of ancestry on FDI is largest for countries that have better (rather than worse) rule of law. Similarly, the effect is larger for intermediate goods than for consumption goods (weighing against the preference-based channel). We also find that the effect of ancestry on FDI is largest for relationships that we might consider to be most associated with asymmetric information – it is largest for countries that are furthest away geographically and in sectors that may be associated with a higher degree of information asymmetry (manufacturing versus natural resources). In addition, the effect of ancestry on FDI is highly concave, as one might expect in a model where information asymmetry is the main friction – the first few descendants from a given origin have a significantly higher marginal impact; similarly, there are negative spillovers where the marginal impact of a group of descendants of, for example, Swedish ancestry in a given county falls with the size of the Swedish population in the state, and with the size of individuals of ancestry from neighbouring countries (Chaney 2014, Arkolakis 2010). We also find that the effect of ancestry on FDI is very long-lasting – migrations ranging all the way back to 1880 have a significant effect on the patterns of FDI that exist today. Interestingly, the effect of immigration on FDI is significantly smaller for first-generation immigrants (Borjas 2006). To illustrate the quantitative implications of our results, we calculate the effect of Chinese exclusion – the effective ban on Chinese immigration between 1882 and 1965. Absent this ban, we predict the fraction of counties in the Northeast with FDI links to China would have increased substantially (doubled in New York State, for example; see Figure 2). Notes: The map on the left depicts the predicted increase in the probability that any firm within a given county has an FDI link with China in a counterfactual world if Chinese immigration had not been discriminated against between 1882 and 1965. Darker colours indicate a higher increase. The bar graph on the right shows the fraction of counties within each state with FDI relations with China (light colour), and the predicted increment under the assumption of no Chinese exclusion (dark colour). Arkolakis, C (2010) "Market penetration costs and the new consumer margin in international trade", Journal of Political Economy, 118(5): 1151-99. Borjas, G J (2006) “Making it in America: Social mobility in the immigrant population”, NBER, Working Paper 12088. Burchardi, K B and T A Hassan (2013) “The economic impact of social ties: Evidence from German reunification”, Quarterly Journal of Economics, 128: 1219-1271. Burchardi, K B, T Chaney and T A Hassan (2016) “Migrants, ancestors, and foreign investments”, NBER, Working Paper 21847. Chaney, T (2014) "The network structure of international trade", American Economic Review, 104(11): 3600-34. Chaney, T (2016) “Networks in international trade”, in Y Bramoulle, A Galleoti and B Rogers (eds), Oxford Handbook of the Economics of Networks, Oxford University Press. Fuchs-Schuendeln, N and T A Hassan (2015) “Natural experiments in macroeconomics”, NBER, Working Paper 21228. Holmes, T J, E R McGrattan and E C Prescott (2015) “Quid pro quo: Technology capital transfers for market access in China", The Review of Economic Studies, 82: 1154-1193. McGrattan, E R and E C Prescott (2010) “Technology capital and the US current account", American Economic Review, 100: 1493-1522. The global number of international migrants reached 232 million in 2013, an all-time high (UN Population Facts No 2013/2). For surveys of the literature linking social ties and ancestry networks to macroeconomic outcomes see Fuchs-Schuendeln and Hassan (2015) and Chaney (2016). Consistent with these results, Burchardi and Hassan (2013) argue that social ties to East Germans provided West German households and firms with valuable information after the fall of the Berlin Wall.